2019 Best of Accounting winners announced on ClearlyRated.com! ClearlyRated® (formerly known as Inavero) is thrilled to announce winners of the 2019 Best of Accounting award program! We’re incredibly excited to recognize the Best of Accounting winners for their commitment to service excellence and their efforts to foster a memorable and remarkable client experience. What is Best of AccountingTM? Best of Accounting is an industry award recognizing accounting firms that have demonstrated exceptional service quality based exclusively on ratings provided by their clients. This annual award program helps service leaders differentiate in a crowded marketplace and provides prospective clients with a credible and transparent symbol of quality as they vet accounting service providers. How do accounting firms win Best of Accounting? Using the ClearlyRated survey process, clients of participating firms are sent an online survey asking them to rate their satisfaction with their firm based on the Net Promoter® survey methodology. Participating firms’ client survey responses are calculated and validated by third party research firm and competition administrator, ClearlyRated. Based on industry benchmarks for 2019, ClearlyRated determined a minimum satisfaction score that accounting firms must earn to be awarded Best of Accounting – ensuring client satisfaction and service quality at these winning firms is significantly higher than the industry average. The 2019 benchmark for NPS in the accounting industry is just 24%. 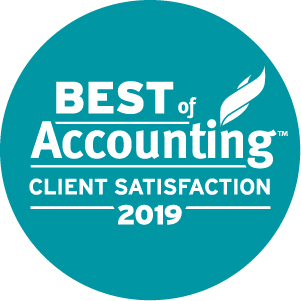 Compare that to winners of the 2019 Best of Accounting competition (who earned a Net Promoter Score of 80% on average), and you’ll find that clients of Best of Accounting winners are 1.7 times more likely to be completely satisfied than the average accounting firm client. At ClearlyRated, we see a significant opportunity for accounting firms to differentiate (and grow) based on the client experience. Our 2019 Accounting Industry Benchmark Study finds that accounting buyers rank referrals, testimonials, and online reviews/ratings (all indicators of the client experience) as top resources for determining the quality of a service provider. And of course, it’s not just your buyers who care about the client experience. Nearly 2 out of 5 accounting clients who have left their provider in the past year did so due to service failures. Improving the client experience helps the bottom line from the inside out. Real-time insights to help you grow client satisfaction and improve word-of-mouth reputation. Validated online ratings from clients to help build online reputation. A credible third-party award offering proof of superior service quality to clients and prospects. Interested in participating in Best of Accounting? There’s still time to compete for the 2019 award! Simply click here to register or contact us to request a demo with one of our consultants. Eric Gregg is the CEO & Founder of ClearlyRated, a leading provider of client satisfaction surveys for B2B firms. Eric is a renowned thought leader in the B2B service quality space, and enjoys making his marketing team squirm with campy clip art and long-winded personal anecdotes.